Cannonball is another puzzle designed by Mike Reilly. A couple of weeks ago, I also reviewed his Reilly's Cube (see here). The first version of the Cannonball was first produced by Skor-Mor, way back in 1973. An interesting fact is that there was included with the puzzle, a booklet with flat shapes that were possible to build with its pieces, reminiscent of the Tangram. The Cannonball is comprised of seven pieces, all dissimilar and with a common characteristic: each one is a different configuration with 5 cannon balls, for a total of 35 balls. The goal is stack all seven pieces into a 5x5x5 pyramid shape. The puzzle measures about 13cm in base length (roughly 5"). 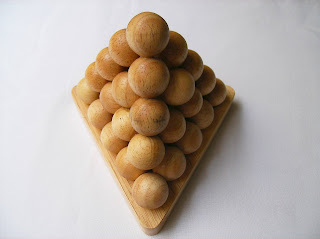 Also worth noting, the base is carved with 15 semi-spheres, which is a good way of keeping the pieces from moving. Very nice design feature. Every since I started my collection, I had a particular taste for pyramid shaped puzzles. I have now several of them and a few with this type of cannon ball design. My guess is that they were based on Mike's old design, since his, dates from 1973. From the designs I have, two are closely related: One is called the Infernal Pyramid. It has six pieces as well, but it's only a 4x4x4; The Stacking Pyramid, on the other hand, is a 5x5x5, except for its 10 pieces. 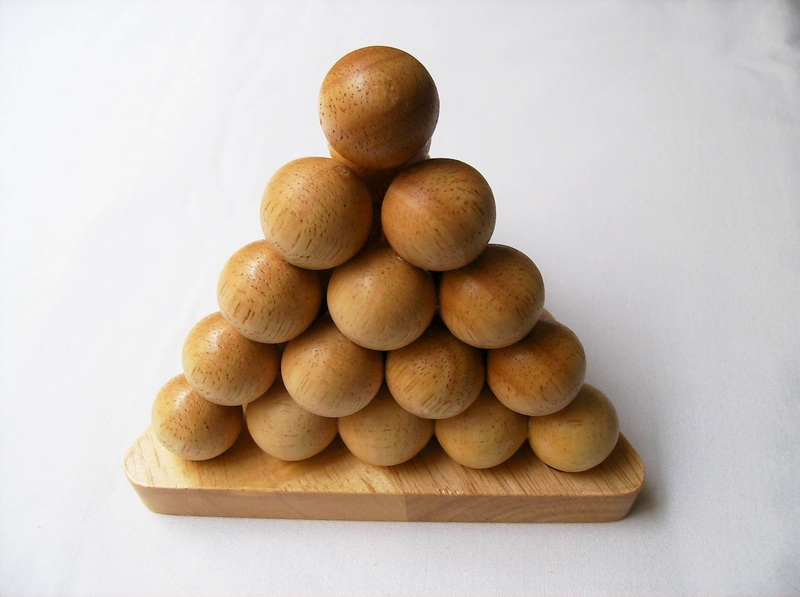 Here, more is less actually, because the 10 pieces make the puzzle a bit easier, since the pieces are a mixture from two to four balls glued together - None of them is a 5-ball piece, so the complexity level is much more simple, thus making the puzzle easy to solve. While the concept of the Cannonball was a little similar to what I already had experienced, I was still curious to try one with 5-ball pieces. I have to say, I wasn't disappointed... Solving wise, the puzzle is quite the challenge. It took me two sessions and a total of about two hours to finally solve it. The hardest part was finding the correct orientation for a couple of pieces that seemed not to fit anywhere. In most of the pieces, I had a pretty good idea on how they would appear when correctly placed, but these two were just a pain to figure out. I just have one remark regarding the finished appearance of the puzzle. When solved, the pieces don't seem to perfectly fit together and viewed from different angles, it gives the impression that there's still room to align them, but no matter how you manipulate the pieces, they always seem out of place. At first, I thought it was just me that didn't solve it correctly. However, after carefully inspected the solution sheet, I could see that there wasn't anything wrong with my solution. It's a tiny design flaw that affects the overall look of the puzzle, but nothing that will spoil your solving experience. Despite the apparent misalignment of the pieces, the Cannonball is a very nice puzzle. It will certainly provide you with a tough challenge and some serious creative thinking before you can say, "Solved!". Definitely recommended for a more experienced puzzler. Availability: The Cannonball is available at Puzzle Crafthouse for $20 USD. For an easier challenge, you can get a smaller 4x4x4 Cannonball puzzle instead. Very nice! I am a fan of pyramid puzzles as well! Do you have a Kadon Giant Pyramid? That is my favorite. 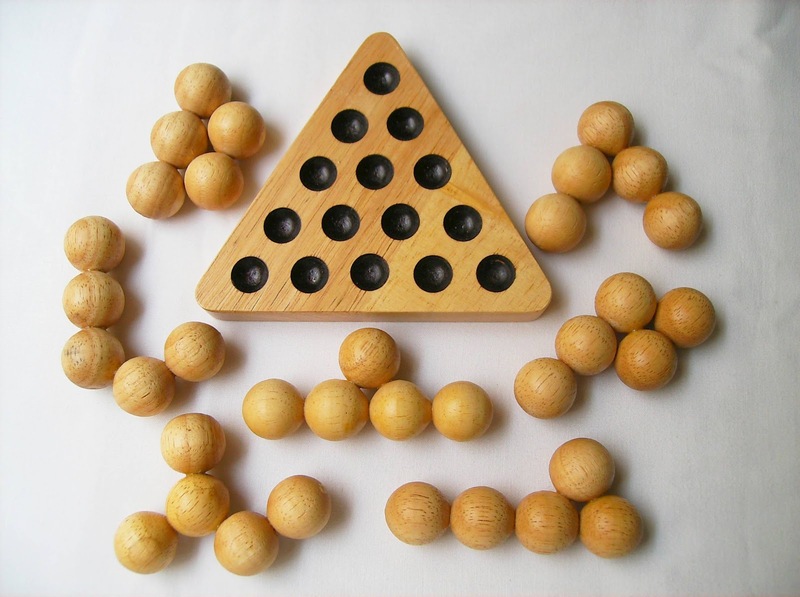 The easiest way to make such a puzzle is to drill holes in the balls, then insert dowels and glue and slide them together. The problem is if you push the balls together until they touch, they will actually end up a little bit closer together than they should. You need to stop before they end up touching. I wonder if this could be the source of your misalignment problem? Unfortunately, I don't have a Giant Pyramid. I do love the beautiful design with its crystal look, and for $35, it's a steal. I will certainly consider it in a future purchase. I bet that touching is the problem of the Cannonball puzzle, as I don't see any dowels, just balls glued together. Thanks for the feedback.